The Apple Portable Power Adapter has a clever design which allows the DC cable to be wound neatly around itself for easy cable storage. Colored status LED's located in the tip indicate charging status. Amber lets you know that your laptop is charging, green lets you know the battery is fully charged. 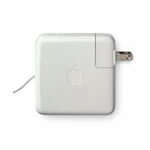 The AC cord provides maximum cord length, while the AC wall adapter saves space. This used Apple 45w laptop power adapter is in good condition. Includes the mini AC wall adapter. The long AC cord is optional.